Entertaining in your home becomes easier when your home is equipped with its very own wet bar. Whether you choose to build a fully equipped mini-kitchen or just a niche carved out for drink assembly and glassware, this space is sure to impress your guests. Installing a simple built-in niche gives you the space you need to conveniently make drinks and bring them out to the living space or entertaining areas. However, adding a full L or U-shaped peninsula with seating will invite your guests to sit down at your wet bar and enjoy the ambiance of the space. Here are five wet bar features that are sure to add a “wow” factor to your home. 1) SINKS – Think outside of the box with unique shapes and sizes! As a custom home builder we’ve seen everything from martini glass shaped sinks to farm sinks & hammered metal or rock. 2) LIGHTING – There are lighting options to help fill any look that a homeowner is trying to fulfill. We love seeing oversized pendants or unique accent lighting within the space. Lighting adds ambiance to every space, so why not highlight your space with lighting to show off your unique features. 3) BACKSPLASH – Adding a backsplash helps pull together the look of the space. Instead of installing a more common ceramic tile backsplash, explore other options like slate, stone or reclaimed wood. 4) APPLIANCES – Options for appliances in bar spaces have grown tremendously over the past few years. It is a fun way to add capabilities to your wet bar. Whether you envision a typical mini-refrigerator or want something that draws attention, like a full fridge, microwave drawer, ice machine, or beverage drawer, you can’t go wrong with the increased capabilities for use and storage in the space. 5) FLOORING – The bar space in a home is already a unique area, so installing different flooring can help the space stand out even more. 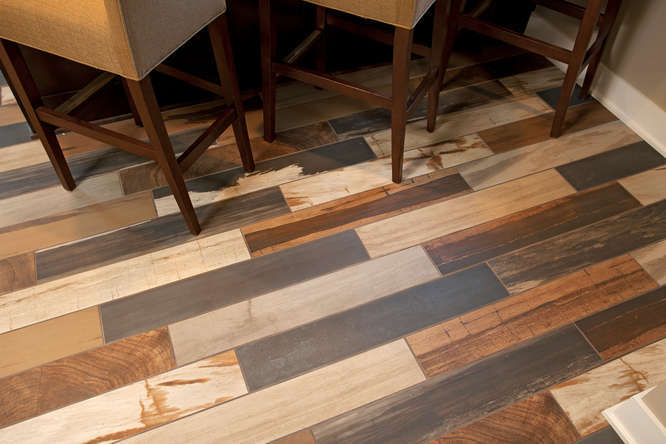 Some fun ideas we have seen include finished concrete flooring or calico floor tile. These are just five of the many unique features homeowners can add to their bar space. For more photos of wet bars that we’ve installed in our custom homes, check out our photo gallery or contact us at info@homesbytradition.com.